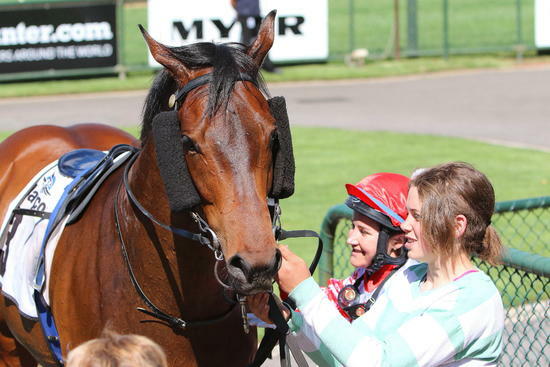 Sadia thrilled Andrew and his owners with a first-up win at Bendigo today. The racing colours worn by Sadia are the colours of owner Brett Lowry, who designed the colours incorporating 65 red roses as a means of creating awareness for Cystic Fibrosis. '65 Roses' is the National Fundraising Campaign for Cystic Fibrosis - the campaign aims to raise awareness and funds to extend and improve the quality of life for people with cystic fibrosis. http://www.65roses.org.au/ . Andrew is appreciative that his owners have allowed him to take the time he needed to develop Sadia into a true racehorse, and was very happy that Sadia rewarded their patience. Andrew believes Sadia is better suited over 2000 metres, so the win today over the 1300 metres was a pleasant bonus. Andrew is looking forward to stepping him out over the longer distances and is hoping his owners continue to have more success and enjoyment with him in the future.